Our collection of resources related to the design and implementation of active learning strategies. You'll need to login to edit this wiki. 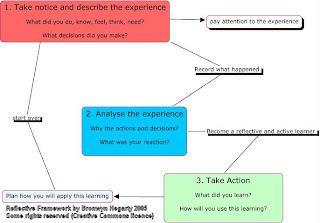 The idea is to encourage reflective writing using a template so that users step through three steps of reflection - 1. Take notice and describe the experience - what you know, think feel, need, decisions; 2. analyse the experience - why the actions and decisions, reactions, 3. Take action - what learned and how will you use it - goals. This framework is used with a template with prompts to create evidence for electronic portfolios. Craig Nelson - (click on the name to find the paper or copy this out http://tinyurl.com/2tvdjx ). For some reason my edits don't always stay even though I am saving. The link below is probably being confused as a WIKIWORD problem. EricPdfResources I made a separate page for them so that this page would stay neater.